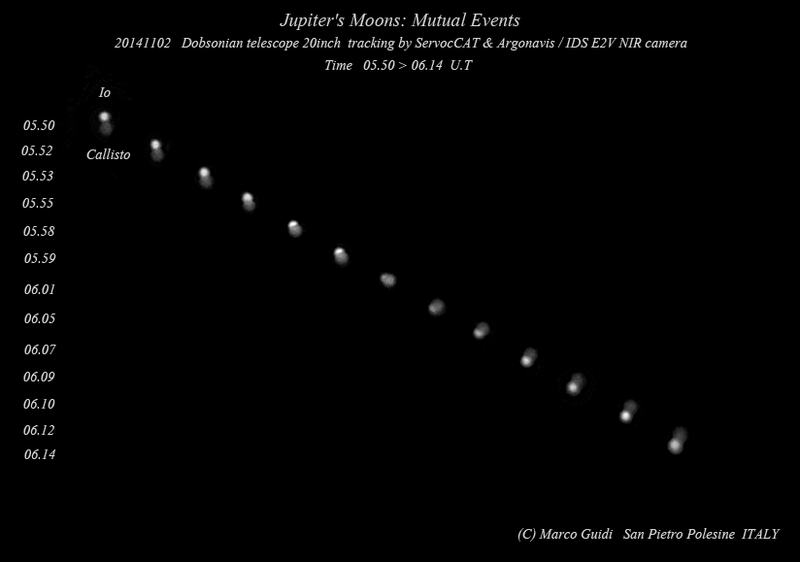 Explanation: A 24 minute sequence from top to bottom, this intriguing series of telescopic frames tracks the occultation of Io by Callisto, two of Jupiter's Galilean moons, from San Pietro Polesine, Italy, planet Earth. A challenging observational project using a small telescope, the two contrasting Jovian worlds are both slightly larger than Earth's Moon. In fact, bright, volcanic Io and dark, cratered Callisto are about 3,640 and 4,820 kilometres in diameter respectively. With Earth itself now crossing near the orbital plane of Jupiter's moons, astronomers are enjoying a season of Galilean moon mutual events ranging from eclipses to occultations. The series of orbital plane crossings produce a mutual event season every 5 to 6 years.